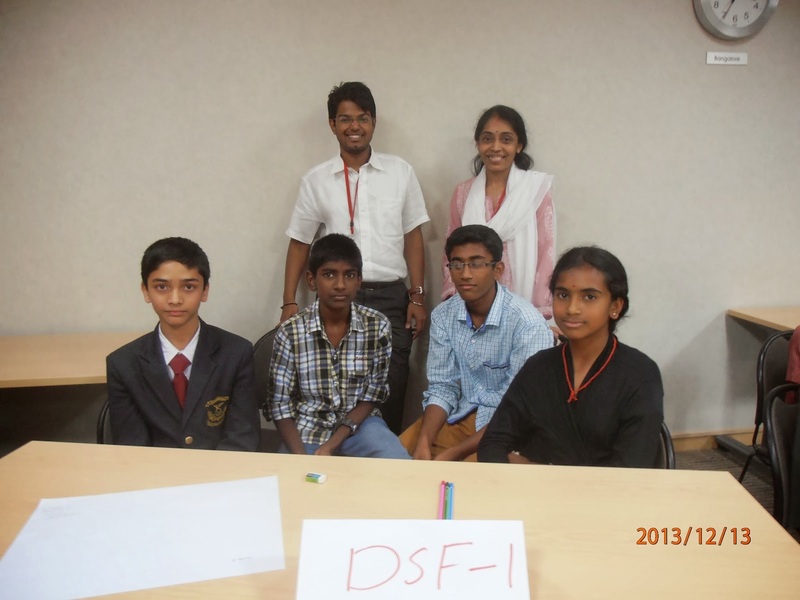 As a part of the International Giving Week 2013, Target Corporation, India, hosted several competitions that saw a number of schools and NGOs participate. The events included Quiz, Rangoli, Painting and Spell Bee. Being one of our partners and a company that strongly champions child’s rights, the Dream School Foundation, was excited to be a part of this special day. Here’s a low-down on a day that saw some spectacular results. Right from the preliminary round, our students were in the lead. Comprising of three rounds, our performance was unmatched from the word go. Kevin Jesse, Manjunath, Vanitha and Musab worked together as a synchronized team and answered almost all questions that were directed to them. In one of the rounds, as the Quiz Master was reading out the question, like a bolt of lightening, Kevin shouted out the answer even before the question was completed. The awestruck audience applauded his speed and knowledge. The other teams did a commendable job in giving our students stiff competition, but in the end, we emerged victorious and bagged the FIRST place. In the last few years, the International Spelling Bee Competition has seen Indian kids bag the coveted top prize. In an effort to continue the proud trend, students of the Dream School Foundation practiced hard and spared no effort in lapping up infinite words of the dictionary. Though the all-girls team, didn't place in the top three, our performance was commendable and we hope to better our skills and emerge as the Queen of a Spelling Bee competition, soon enough. Considered a dying art, Rangoli which has adorned the front doors of many Indian households, is still a decoration that is practiced by a few. The Ragoli competition that required some incredible creativity saw some colourful compositions. In under thirty minutes, our team comprising of Roopa VT, Shobha Rodha and Aishwarya Barick, came up with an impromptu design and were adjudicated as the THIRD prize winners. With textbooks that weigh a ton and homework that will keep you awake till the wee hours of the night, one really wonders where a child is to find time to practice art or music. Putting together a team of our very own M.F.Hussains and Tayeb Mehtas, ten students from the Government Urdu School and Government Tamil School, N.S. 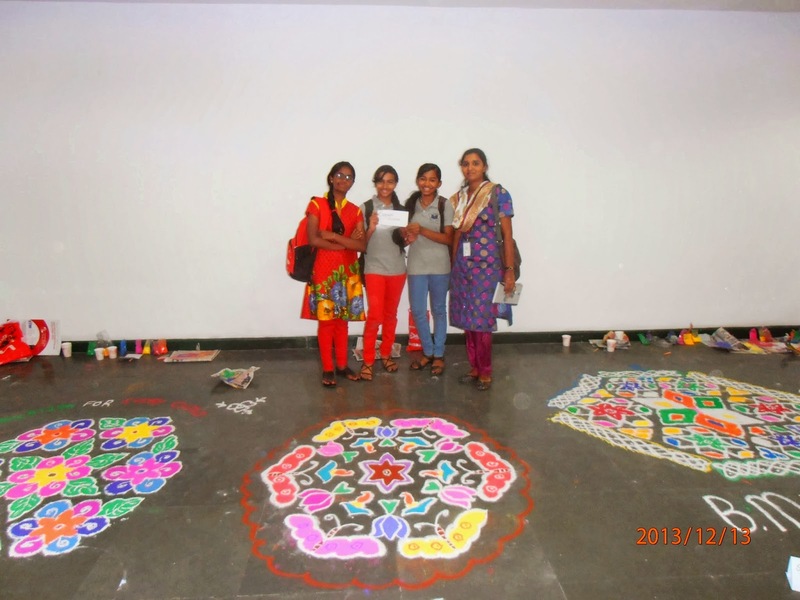 Lane, R.T.Nagar showcased their artistic acumen with some extremely colourful and picturesque paintings. Yakesh of the Government Tamil School was awarded the SECOND place which was no small feat, considering the competition was stiff and saw a large number of participants. We tip our hats to you, Yakesh. At the prize distribution ceremony our students received accolades and goodies from leaders of Target Corporation, India, and a snack box that left their hearts and tummies content. We congratulate the winners and thank our partner Target, for the immense support and the opportunity that you continue to share with all of us, at the Dream School Foundation. In the midst of nature, hills that towered into the clouds, fresh air, birds and beasts that dotted the landscape- it all looked like straight out of a movie. Oh! Wait! It actually is! Hosting the likes of Bachchan and Dharmendra, for the shooting of the timeless Bollywood classic, Sholay, Ramnagaram , located about 50 kilometres outside Bangalore, was also the setting for the Dream School Foundation’s adventure outing. Leading the expedition was Sunand Sampath who in the past, has conquered many a mountain peaks around the world, all set to capture the minds and hearts of those teeming teens from our various centers. Setting aside, Algae, Akbar and Algebra, students were in store for lessons that you’d seldom find in school curriculum. The Antakshari competition on the bus ride brought out the competitive side of the two teams that belted out filmy numbers and even the national anthem in an attempt to outdo their rivaling team. As we took a short walk to our camp site, we were amazed by sights that one would never witness in the city of Bangalore. Nature sure smiled upon us as the weather and mood was just perfect for a full day of fun learning. Rumbling tummies found reprieve as piping hot upma, an Indian donut (the indigenous vada) and a healthy helping of kesaribath was gorged down, taking energy levels to the fullest. the second contingent got ready to tackle Zummaring. Some who might get dizzy by just looking at the height from where you were expected to zip line across would definitely think a million times before strapping up for the adrenaline pumping ride. Ensuring the highest safety standards was of priority, the first student was all set to take the leap of faith and traverse on to the other side. Off he went, and whoosh! Cheered by friends from terra firma, all fears were allayed and everybody waited for their chance with much eagerness. One by one, students whizzed passed and had ear to ear smiles and screams of excitement as the zipped across to the other side. Panning across to the Zummaring arena, the Yo! Yo! Rockstars were at it like pros. Also a lesson in mountain climbing, this exercise taught one how to tackle those tricky treks the right way. Those who gave up half way were egged on by teammates to put in that extra effort and reach the top. It was this spirit that was heartening to see, as another lesson in teamwork and team spirit was successfully being put into action. As groups concluded both activities it was time to replenish those energy levels with a sumptuous lunch. A quick lunch break and wetting those throats that were well parched from all that cheering, the latest set of adventure enthusiasts were all set for the toughest activity of all- Rappelling. Rappelling down a steep rock face is no child’s play, but the instructors at our camp were simply superb; encouraging words and allaying their fears, the instructors made sure all our students felt safe and protected as they took that first step off the edge. Those who had conquered their fears and completed the activity did a splendid job in reassuring their friends that there was nothing to worry about. At the other end of the camp, a game of Dodge Ball was on, which involved a lot of team work and strategizing to emerge victorious. Once again, those lessons that Sunand Sir had to share were being put into practice, bringing out the best in our students. Concluding the day’s activities, the last and final activity was Tug-O-War. Split into two teams, on command, they pulled at the rope like they were hauling an elephant. The team that won was elated with joy as they hi-fived each other, content and lauding their team efforts. As we journeyed back, the mood was sober, as all of us soaked in each and every moment of our day. The picturesque setting, the activities and all those valuable lessons that otherwise are hard to come by. For us, this day will go down as a memorable one that will remain fresh in our minds just like the air that Ramnagaram had to offer. For us, this day will remain etched and woven deep into our hearts as a day of fun and learning in the many years to come. As students of the 8th assembled at the Dream School Foundation, R.T.Nagar Centre, the atmosphere was ripe with excitement. Gathered at least 15 minutes ahead of the time mentioned and dressed in their brightest and best,this out-of-textbook learning experience was one lesson that would stay etched forever.As we drove past the entry gate at Manyata Tech Park, peering out of our tempo traveler, our eyes scanned the multitude of glass buildings in amazement that adorned this business park. On reaching Target’s main office and entering the plush building, the students gathered in a massive meeting room that looked straight out of a movie-set. The interaction began with Mr.Paresh, Delivery Manager at Target Corporation India, addressing the gathering and extending a warm welcome to his shy guests--but such inhibitions of shyness and coy were very short lived. A quick round of introductions by the students and volunteers,all dressed in their customary red and khaki was more than sufficient to get everybody to behave like they’d known each other for years. A brief video about Target’s work and vision showed us, with sufficient reason, why they are leaders in their work and social responsibility. From introductions to more important business- a sumptuous meal awaited us at office cafeteria that was lapped up by students and staff alike. The buffet service saw us help ourselves to generous mounds of delicious rotis, rice, curry and a whole lot of other items. Energized and ready to go, the recreation room was our next destination. Target employees who were peacefully engaged in a game of table tennis or carom were politely asked to step aside, as students of DSF gleefully entertained themselves to these indoor games. In one corner, lay a drum set where Mr.Murali Bhatt entertained the students with a beat or two. To the surprise of many, Manoj, took to the drums and gave us a perfect rendition of some popular drum beat numbers. Divided into five groups, each team was led by two volunteers from Target, who took us on a tour of the 4th floor, which was home to those friendly faces like Shahbaz Sir and Saravanan Sir, that came each week and took various classes for students at the DSF, R.T.Nagar Centre. Explaining each matter in detail, students were told about an employee’s functions, the facilities that were essential in their operations, such as telephones, laptops, wi-fi etc. A quick visit to Room 403 and suddenly we were privy to a live video conference! At the other end of the call were Mr.Paresh and some of the students from another group. Rather different from other business conference calls, matters discussed included Antaakshari, which group was superior and most importantly, one of our students, in a professional tone, questioning Mr.Paresh on how his projects were shaping up-- a small role play! Returning to the recreation room, this time with a different agenda, groups sat together and were engaged in a thrilling quiz. As reward for the right answer, chocolates were distributed. A quick count showed that though only about 15 questions were asked, there were at least 60 chocolates in possession-- a telling sign of the giving nature of Target’s employees. The next team building game was ‘Make the Mummy’, where groups of eight, along with their team leaders were to drape one student in newspaper and replicate a mummy in the shortest time. At the end of the event, some mummy’s didn’t quite turn out as they were expected to be--some resembled a robot, others a rock star. At the end of the event there was indeed a moral--working as a team is essential in achieving success. As the day’s events came to a close, and it was time to bid adieu, students had their special messages penned on cardboard sheets, to be framed and that will go up on the walls of Target for posterity. 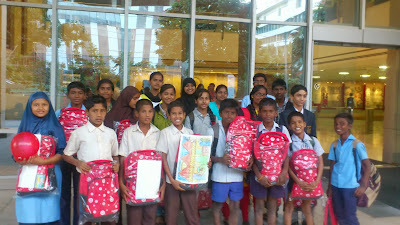 As part of another generous gesture by Target, they handed us bright red school bags to take home as a souvenir. On our return journey, the mood was sober. Not because students were tired or exhausted, but for them, this meant the end of an experience of a lifetime. As I randomly asked who would like to work in Target? The answer was evident-- they didn’t raise just one hand, but both hands shot up, symbolizing how much an experience like this had influenced their thoughts positively. In conclusion, as we sum up this day, just like Target’s logo, this day sure did strike the bull’s eye of each child’s heart.